We got to meet the talented mr Cody Wright at Bass Player Live in Los Angeles in October. His encounter with EBS effects was love at first sight and we are proud and happy to now welcome Cody as EBS Pedal Artist! 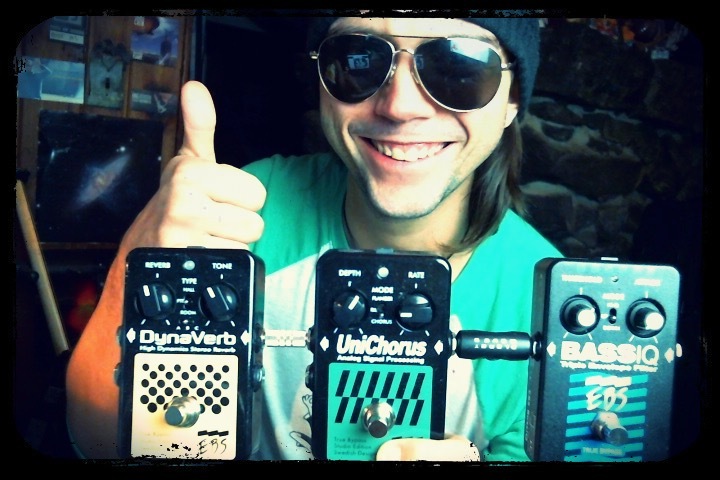 “I currently use the EBS DynaVerb, UniChorus, and BASSIQ on my pedalboard while on tour with the Eric Gales Band. The quality of these effects is absolutely unbelievable and must be experienced to be understood. When I use the UniChorus, everybody thinks I’m playing a fretless. Go try them now! They’re totally organic sounding and very flexible to your own style. Two thumbs up!! !”, says Cody. Multi-instrumentalist Cody Wright is quickly earning a reputation as one of the most innovative, soulful, and jaw-dropping young performers in the country. He plays bass, guitar, and keyboards and was co-composer for the 2016 multi-platform video game release of Toejam and Earl: Back in the Groove. He has toured nationally & internationally with Eric Gales Band (current), Jonathan Scales Fourchestra, Everyone Orchestra, the James Brown Dance Party & Jazz is Phish. Cody has performed and/or recorded with with Victor Wooten (and the Wooten Brothers), Michael Manring, Eric Gales, Jeff Coffin, Oteil Burbridge, Etienne M’Bappe (of John McLaughlin Band), Tony Grey (Hiromi), Kebbi Williams, Felix Pastorius, members of the Duhks & Lee Boys, and members of the Tedeschi/Trucks Band, among others. Cody’s early training in jazz, fusion, and blues guitar has left him with a keen sense of melody, harmony, and phrasing. His use of the pick and two-handed tapping technique gives him unique tone and facility, but above all, his unabashed love for music shines through in every note he plays. 2017 will usher in Cody’s much anticipated first solo album.